I recently reinstalled my laptop completely (it is very nice Dell XPS M1330) and took that opportunity to make it into decent development machine (w/o all the stupid preinstalled applications). Installed also Visual Studio 2005 and 2008, SQL 2005 Express and all the little tools necessary (ClipX for example). 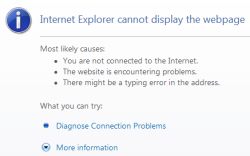 Fired up latest web site on which I work on, F5 and … nothing – dreadfull message of “Internet Explorer cannot display the webpage”. Ok, no panic here, let try Visual Studio 2008 with same web site; nothing 🙁 Same site, on two other development machines (Vista & Vista 64) under VS 2005 and VS 2008 works w/o problem. Started researching and debugging; it turns out that next generation protocol IPv6, or its implementation on Vista clashes with integrated web server WebDev.WebServer.exe; WebDev has a problem finding localhost address in default configuration. No restart is needed, either of computer or Visual Studio. Thank you for this post! After hours of trying to figure out this problem, this was the only help I found. Thanks buddy, You saved my day!!! New to Asp.NET… I got this problem when i ran my first Hello World App.. I got links for first iis, then .net, use asp_regiis, Anti virus is running, add localhost to trusted site, run application as admin privilages, but it was so simple that just add # WORKED finally!!! Since morning 9am, i have started my search, its almost 3:15am, and have the solution!! As all previous poster. Thank you very,very much. After spending half a day trying to find out why my websites didn’t work using the build in webserver and even installing VS 2008 again, I finally found your site. Either this problem is very rare or nobody wants to write about it, even on the site of MS I couldn’t find anything. But this solved it for me. Thanks again. thanks man… what is strange in my turn is everything was going fine, suddenly got this error, don’t know why, but i used your great solution to save my job! I am glad that my article helped 🙂 Happy programming. It solved my problem! I worked more than one year and sudenly I received this error !!! Searched for hours and tried hundreds of different things and this is all I needed. Upgraded my Visual Studio 2008 from the trial version with 2005 already on the machine and got same problem. This fixed it – many thanks for the post. Unfortunatly, I have the same trouble, but not she same configuration. The issue is comming randomly. Does someone have another solution? Thanks a lot after wasting of 3 Hours I find this site and I solved my Problem. Thanks a lot after wasting of 3 Hours I find this article and solved my problem. Next Next post: A ko, ako ne ti?